Speakers produce sound! You already know that, but do you know how they work? This article will guide you through a conceptual overview of how speakers convert an electrical signal into sound. No matter what you are told, no matter how pretty they look, no matter how fancy of words people use, speakers just make sound. Although the explanation of what they do is simple, how speakers work, and how to make them work well, can be extremely complicated. Gaining knowledge about how speakers work will better help you understand how a speaker functions, as well as help you become an informed buyer when you purchase audio equipment. Sound is a phrase that typically refers to frequencies that the human ear can hear (20Hz -20,000Hz). Sound is created by the fluctuation of air pressure caused by the movement and/or vibration of a given object. When an object moves or vibrates, it transmits the kinetic energy to the air particles around it. The most common analogy for this is to visualize waves in water. Frequency is the word we use to describe the length of a single wave. The frequency is affected by the speed of vibration of the sound-creating object. Slower vibrations equate to lower-frequency sounds. Faster vibrations make higher-frequency sounds. As stated above, the human ear can hear frequencies from 20Hz to 20,000Hz (20kHZ). When a sound's frequency is on the lower end of our hearing scale (down near 20hz), we hear deep/low notes/sounds we commonly call Bass. When the frequency is up near 20kHz, we hear high-pitched sounds we commonly call Treble. We call the middle ground frequencies Midrange. Those of us who are fortunate enough to be able to hear most of these frequencies know that we are surrounded by sounds at all times; the world is a noisy place. Humans are capable of creating sounds in many ways. Most of us can make sound with our vocal cords. Some of us are able to use our hands or lung power to make instruments produce sounds. Babies cry for their parents, children bang on plates, teenagers scream at their parents, and some of us use our knowledge of science to create eqiupment that can reproduce sound; speakers! We are all deeply connected to sound in many ways. Knowledge of how we create sound, and incororate it into our daily lives, will help you notice phenomena that you never knew were there. How do Speakers make sound? A speaker's function is fairly simple. A speaker converts electrical signals into acoustical energy: sound. By moving back and forth, the speaker increases and decreases the air pressure in front of it thus creating sound waves. Below is a basic diagram of a speaker. As you can see, there are not many parts. However, minimal variations in each component can have dramatic effect on the speaker's performance. The Essentials: Cone, Suspension, Magnet, Voice Coil, and Frame. The cone is the main moving mass of the speaker. The larger the cone, the more mass and surface area a speaker will have. The more surface area a speaker has, the more air it can move. The more air it can move, the louder the speaker can get; In a nutshell. NOTE: Accurate, High frequency replication requires smaller specialty drivers; tweeters. The suspension and the spider keep the voice coil aligned and act like a spring when the speaker is in motion. The suspension pulls the cone back to the center position when it moves back and forth. If there were no suspension, there would be nothing to hold the voice coil and cone in place. The rigidity, composition, and design of the suspension can greatly affect a speaker's performance. Below is a diagram of how a speaker's suspension works. The magnet structure is what creates the standing magnetic field. This standing magnetic field gives the voice coil's generated field something to push off of. A strong standing magnetic field allows greater cone motion potential. The stronger this field is, the further it spans thus allowing a voice coil's field more to push off of. 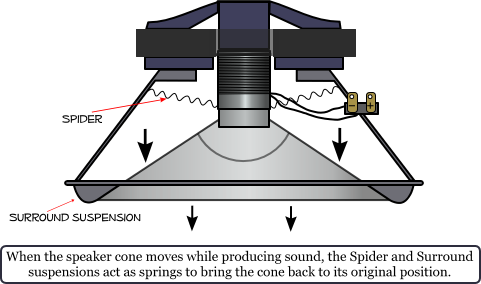 The entire action is similar to the idea behind a solenoid. The below diagram demonstrates the voice coil's relationship with the standing magnet field. The voice coil and standing magnetic field are what makes the cone move. When an electrical current/signal from from an audio amplifier (alternating at the same frequency as the sound that created it) is put into a speaker's voice coil, the voice coil generates an alternating magnetic field. The alternating polarity of the voice coil causes it to be repelled-from and attracted-to the standing magnetic field. This action of alternating attracting and repelling causes the cone (attached to the voice coil) to move! When the cone moves between 20Hz-20 KHz, the speaker makes sound that we can hear! All of the above components are held together by the frame. The voice coil is connected to the cone which is connected to the frame via the suspension and spider. The magnet structure is held in place by the frame. The frame keeps the family together and it has to be strong to keep everyone together when things start moving. Without anyone of these crucial components, the speaker would not exist. Drivers are specialist. Drivers are speakers that have a certain job to fill and that job is voicing a certain range of frequencies. There are traditionally three types of drivers: Woofers, Midrange, and tweeters. 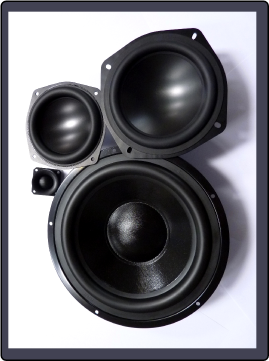 Woofers specialize in producing low frequencies and are the largest of the drivers. Midrange drivers specialize in producing midrange frequencies. Tweeters specialize in producing high frequencies. Sub-woofers, which you may have heard of, are special drivers that focus on replicating very low frequencies; many of which we can't hear. This driver's purpose is to add the shake, rumble, and roll to a listening experience. Sub-woofers can bring a home theater system closer to sounding and feeling like a movie theater sound system which adds to your home theater experience. Sub-woofers can also make music listening feel like a live experience. Live music experiences are typically experienced at louder volumes where you can feel the bass and impact of the instruments. Subwoofers replicate this sensation but without the other frequencies being at high volume which can be uncomfortable to your ear. Although there are many different types, styles, and sizes, speakers just make sound. Knowing how they make sound can add a new dimension to a listening experience. Much like knowing a little bit about how a car works may change your driving habits, knowledge about speakers can help you operate them more efficiently. We hope this article helps you understand speakers a little more and gives you a little more confidence when you go out a purchase them.